We are excited to announce that Rachel Faucett, the author behind the family-focused design blog Handmade Charlotte, will be guest pinning for our WeAllSew Guest Pinner Handmade Charlotte board through the month of November! Rachel has a great sense of style and loves to inspire others with her finds from all around the world. You will be inspired by her eye for projects, techniques, and fun holiday inspiration. This mother of five has pinned for Martha Stewart, Better Homes and Gardens, Babble-Disney, Coats and Clark, and Plaid Enterprises. According to Business Insiders Handmade Charlotte is considered to be among the top 20 most influential Pinterest users. She’s thrilled to be pinning for BERNINA’s WeAllSew Pinterest guest board Handmade Charlotte , and wants you to join us and follow her pins all month. Follow the We All Sew Pinterest boards by following THIS LINK. 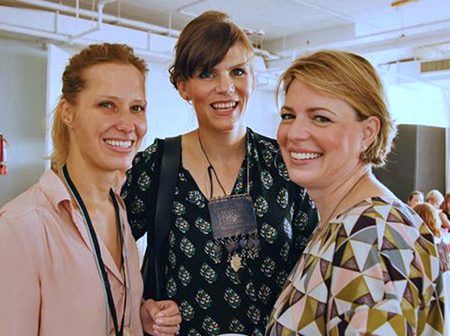 Martha Stewart Headquarters: Handmade Charlotte (middle) with Tea Collection founding designer Emily Meyer (right) and international blogging superstar Irene Hoofs. Next Next post: Guess Who Just Got Her PaintWork Software?